Russel Stover sent me some chocolates to try out and invited me to write a post about Christmas stocking stuffer Ideas. Well... I gotta be honest... we don't usually do stockings around here. So I consulted with some gal pals and then realized... why does it have to be a stocking? Why can't I stuff something else? And hence the giant ice-cream cone was built! Let's get wrapping! Grab your largest cereal box. (We get huge boxes of gluten free cheerios, so that's what I used.) Open up the box. Then cut out a half circle as best as you can. Now use your mighty candy fueled strength and curl the cereal box up into a cone. Staple that sucker shut. Shove your things inside- large items first! Use masking tape to decorate your cone. Then, crumple up some balls of tissue paper to cover the items. Tape on a piece of colorful tissue paper on top to create a mound of ice cream. Repeat this process to create another scoop of ice cream on top. Don't forget to hot glue on pom pom sprinkles for an extra special touch. 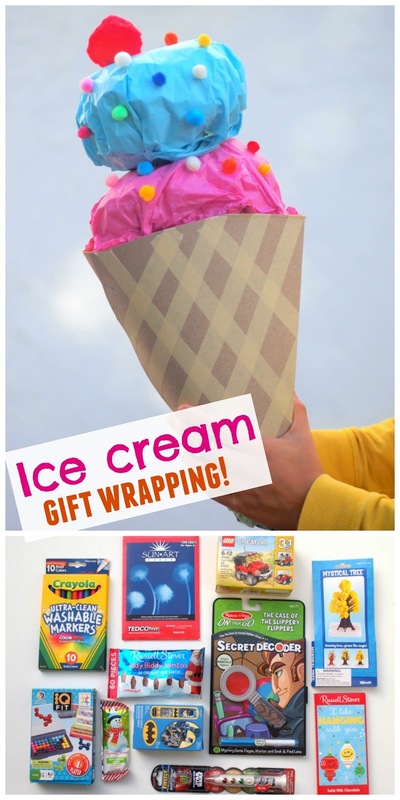 7 More Fun and Unique Ways to Wrap Gifts!